This is so true....I am so struck with every bit of the line in this article . Extremely useful to us who deals with a lot of aged people under our care. Thank you for this wonderful article Del. Our Adult Day program has lost four of our seniors already this year. On top of that, one of my co-workers lost an Uncle and my other co-worker lost a very dear friend of the family to a MVI recently. We have all been struggling with our own grief in our own way. I am giving each of my staff a copy of this and we will be talking it over at our staff meeting next week. Our client losses were not expected so were a double blow to us and our clients. As a group we make small photo albums for the families of their loved ones time with our program, and have everyone sign a card of thanks to the family for sharing their loved one with all of us. We pass the photo album around our group and reminisce as a way of healing with our program attendees. They are encouraged to write down a funny memory or a special moment they remember of the person who has died. We put these in the book as well. This helps all of us heal and the families like the books too. 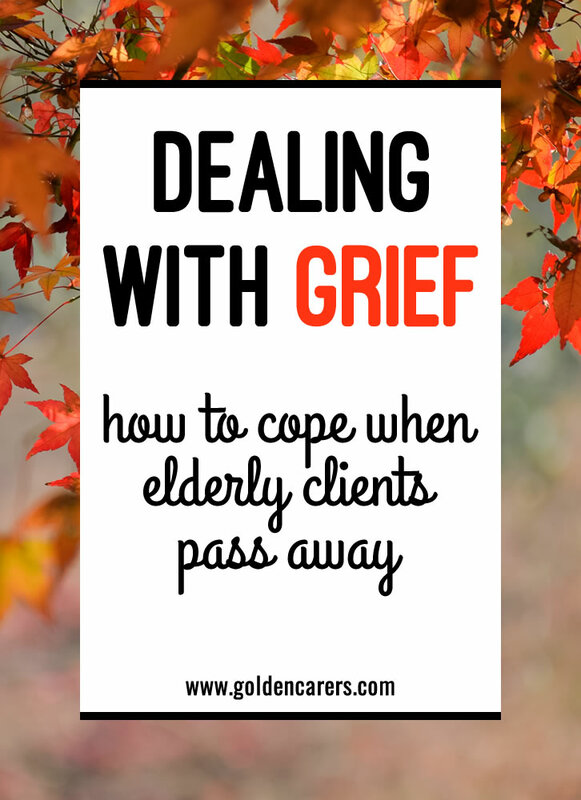 I think as caregivers we often forget to take time to grieve ourselves. That is why I so appreciate your article. It is grounding. Thank you. I too can only say thank you with all my heart. I was just saying today to a colleague how do you cope as we spoke of a resident who was coming back from hospital palletive care. We spoke that it feels at times that you are in a constant feeling of grief as we see residents that you love and care for pass on. I will be taking your article into work tomorrow to share. Thank you again. All the best of luck to you Terri. Thanks for your feedback. A month ago our family experienced the heartache of losing our young officer and his young friend in a tragic accident. My nephew was the driver and fell asleep at the wheel. Both were killed at the scene. I never had a chance to say goodbye to him, and my sister has been brittle dealing with her own grief and heartache. TOday, I sat with one of my elder friends as he passed on. Family was not able to be with him, so I took my ukulele and sang hymns and read psalms. I felt honored to be part of his going on. In our dementia unit, such passing is a blessing as the latter stages of the disease take away life vitality. As his life departed, I asked him to tell my nephew how much I love him and miss him. Later when family arrived, they felt so appreciative that I was there in those moments. But the blessing is mine. This fine man had spent his life serving the church and shared a year with us and much joy. With grief, I try to remember the joys. Thank you, so much to say about this and how needed it is, all I can do right now is say thank you. Thank you Kath for posting. I hope all is well.